Isannah Here is free for Kindle today through Wednesday. This is the last of the Kindle freebie offers for this series. By the way, in the trivia department, since I published this series, I've found out that Paul Revere had a child named Isannah, and also that there's a character named Isannah in the award-winning book Johnny Tremain, set in the American revolution. Who knew? Do you know of other people, real or fictional, named Isannah? I got the name from some Mennonite friends of mine, who have a toddler granddaughter named that. I got to meet Isannah when she came out to live briefly on their dairy farm while her mother dealt with taking care of a newborn. My very young acquaintance has two cousins roughly the same age who live near her grandparents, and it was great fun watching the three little girls playing together. I haven't met Isannah's parents, and I don't know where they got the name. When I told some of the local relatives about Paul Revere having a child named that, they were quite surprised, though, so I'm pretty sure it wasn't from the Revere family. 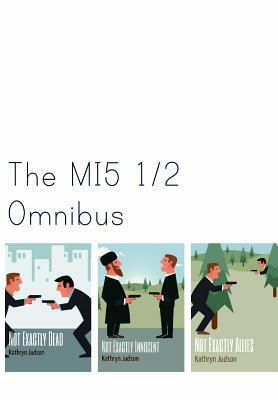 There will be a Goodreads giveaway for The MI5 1/2 Omnibus, one week only, starting tomorrow. There are a dozen countries included for this one. Since one of the main characters, Leandre Durand, is not only Catholic, but insists that people know he is Catholic, it seems only fitting one of those 'countries' for this giveaway is the Vatican, all the more so since Durand is charming, delightful, brave, philosophical, and hates evil. He is, in short, a fairly good Catholic. He is the best friend of the lead male character, known throughout as Triple-O Five (and otherwise sometimes as Richard Hugh, and sometimes as Henry Rochester, because, as it happens, sometimes spies are saddled with fake names). For those of you not familiar with the series, it is serio-comedic fiction (serious topics are included, but the book is laced with humor, even occasional absurdity), with an emphasis on clean romance, with a respect for matrimony. The books were originally written just before I became a Christian. Earlier this year, all three volumes got subjected to a new round of editing, that tightened them up, rearranged a few passages, combined some chapters, deleted a little bit here and there, improved some sentences, and otherwise aimed at making them a better, smoother read. Also, a very few changes were made to bring the stories into better alignment with church teaching. For instance, where I'd had a romance in the second book involving a divorced woman and an FBI agent, it now has her still being a divorced woman, but it is now noted in passing that her former spouse has since died. This makes her free to marry according to the teaching of almost every church on the planet, whereas, as a divorced woman with a living 'ex,' many churches (including the one I now attend) would prohibit another marriage, based upon references in the New Testament that portray divorce as not a dissolving of a marriage, but merely the setting aside of a spouse. In closing, I would like to note that since the omnibus contains three large novels, it was necessary to use somewhat smaller type than I would have liked, to keep the book within a workable size. (I've seen older books with small type, but that's gone out of fashion, and I'm glad of it.) If you need large type, you might want to go with the ebooks. For those of you who have doggedly stayed with this post to the end, Not Exactly Allies, the third book, is free in ebook at several online locations right now. Not Exactly Dead isn't supposed to be free at the same time, but at last report not all the retailers had their catalogs up to date on that. Have fun searching.